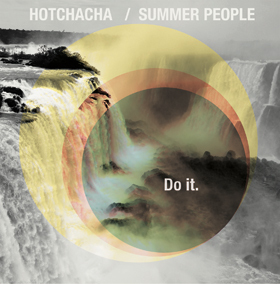 The first four tracks of Do It are from Cleveland’s HotChaCha, delivering mostly simple but effective garage rock. This all-female four-piece has more of a broad appeal than some of the riot grrl acts that preceded them. Their side of the record features three straightforward arty garage rock tracks, and one psychedelic jam, “All Babes are Wolves.” Opening track “Aorist” has the most initial appeal and features a delightful vocal howl as a hook. The singing of Jovana Batkovic has a distinctive tone to it that sounds rooted deep in the history of female-fronted rock. This split record from Exit Stencil Recordings feels a bit more like two EPs played end to end than one cohesive album, but this is forgivable because of the overall quality of the album. The transition between artists is a little jarring on the digital version, but once the transition to Summer People takes place, it settles into its own groove. This record would probably play better on vinyl for one key reason: flipping a vinyl disc provides a momentary pause, cleansing the audio palate before sinking teeth into the artist on the other side. When listening to Do It digitally, that pause is noticeably absent. The eclectic act that is Summer People is definitely worth a momentary pause before listening. The eight members of the New York band make highly varied music, and somehow it never seems to sound cluttered, which can be a challenge for a group half their size. It would have made more sense to me to have their song “94 Chapin” as the first track on the their side, as that song flowed more naturally with the sound of HotChaCha. “The Fox and the Hound” makes for a jarring transition due to a cascading wave of percussion that escalates through the song. The final two tracks sound more similar to each other, the dirge-like “Et Cetera” and “Baseball Bat.” As a final, eclectic note, unless I am mistaken “Et Cetera” features a lyrical reference to Wu-Tang Clan’s Enter the Wu-Tang (36 Chambers).